Christopher written in ancient Babylonian text called cuneiform, the first method of written communication. the way an ancient Babylonian might have written it. The initial writing of the Sumerians utilized simple pictures or pictograms. For example, a drawing of a person’s head, meant the word “head”. Over time, however, the writing of the Sumerians further developed to include sounds and meanings. Scribes would use the stylus to make wedge shaped marks in the clay. 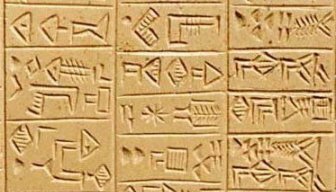 This type of writing is called cuneiform writing, which means “wedge-shaped”. Translating Mesopotamian writing is difficult for archeologists today. This is because there were over 700 different symbols and the symbols’ meaning and shapes could change between different cities and regions. The symbols often changed over time as well. However, many Sumerian tablets have been deciphered. This is how we know so much about Mesopotamian culture, government, and history.